A room at Loews Hôtel Vogue. All photos courtesy of Loews Hôtel Vogue. 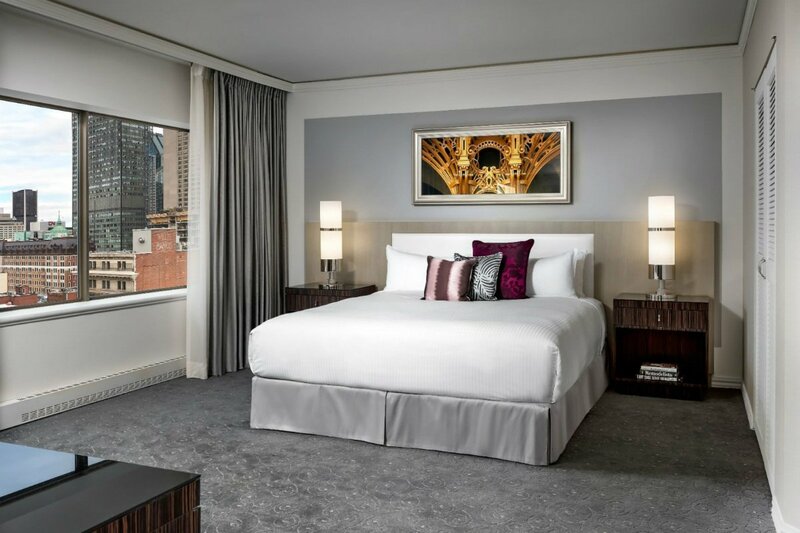 Located amid the hustle and bustle of Montreal's historic Golden Square Mile, Loews Hôtel Vogue is a family-friendly refuge with a certain je ne sais quoi that would delight the most discerning travelers. Fully renovated in 2012, the pied-à-terre-like guest rooms have chic, modern decor and are flooded with natural light. A classic French restaurant with a local touch feeds hungry guests, while some of the city's most exciting restaurants are nearby. The hotel's central location makes for easy access to the Financial and Museum Districts. Style: Simple, modern, and stylish. Newly renovated interiors display fresh design with French influences inspired by the city. Standout Detail: The bar manager at the Luxe Lounge, Francine Des Roches, has been working at the hotel for twenty years and maintains a close relationship with loyal clients and returning guests — and she makes a killer cocktail. She treats newcomers like regulars and makes the chic hotel bar feel intimate and cozy. This Place Is Perfect For: All kinds of travelers. Because of its proximity to the Financial District, the hotel is suitable for business stays, while the restaurant and prime location make it appropriate for leisure trips. 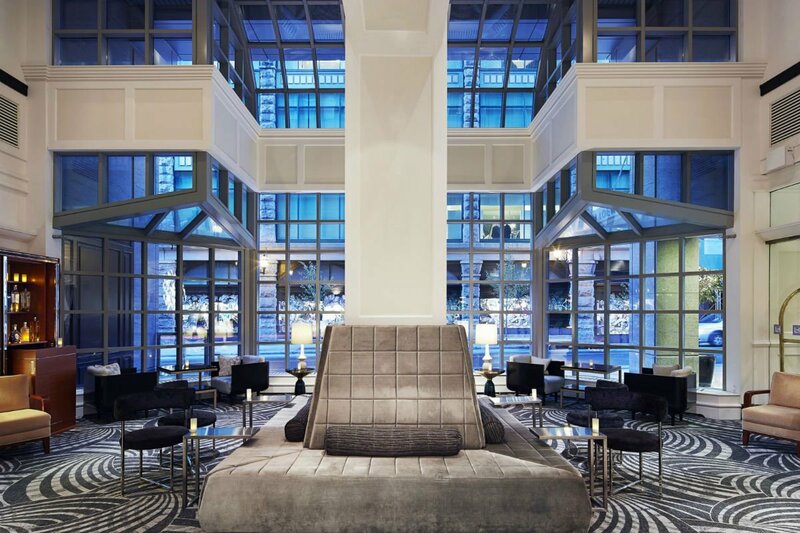 Loews Hôtel Vogue is also family-friendly — so much so that children under the age of eighteen stay for free. Rooms: There are 142 spacious guest rooms and sixteen suites, all brightly lit with natural light from large windows overlooking the city. Silver accents and gray furniture make for an understated but chic vibe. 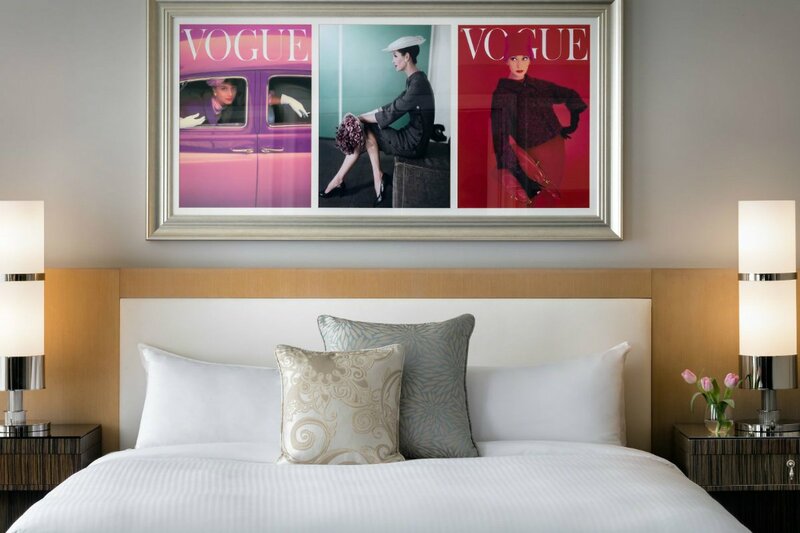 Past Vogue magazine covers decorate the walls, a nod to the hotel's fashionable neighborhood. 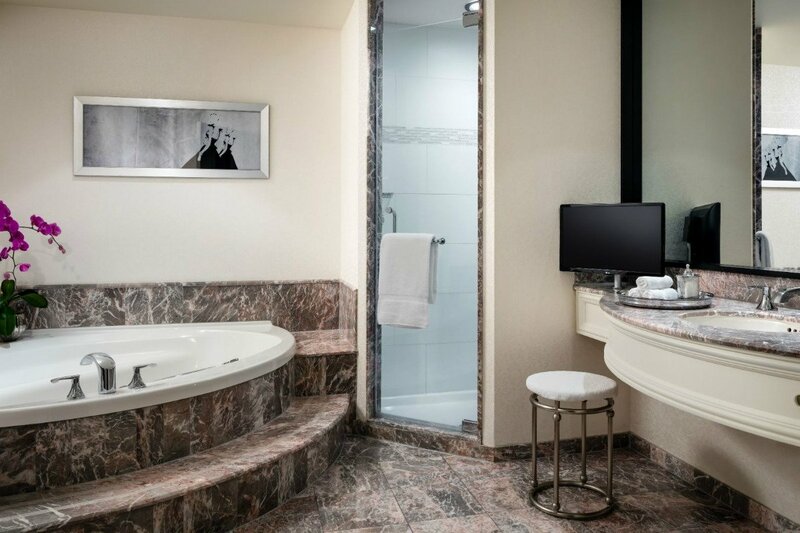 The bathrooms feel luxurious, with marble fittings and Jacuzzi tubs. WiFi is complimentary. On Site: For the active traveler, there is a fitness center on the ninth floor, along with a lobby coffee machine for a boost of energy. Food and Drink: La Société Bistro serves French food in a contemporary North American-style using fresh local ingredients. Of special note are the stunning seafood platters and the oyster bar. 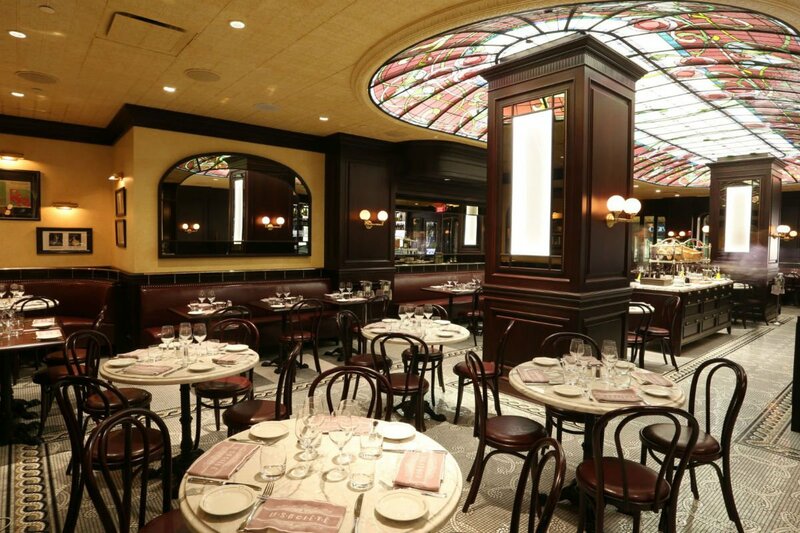 In true Parisian cafe style, interiors are decorated with wooden bistro chairs, a large hardwood bar, and a stunning stained-glass dome ceiling. Lux Lounge, just around the corner from the lobby, is an ideal spot for cocktails before or after dinner. Locals and travelers gather around small tables, creating a comfortable and cozy vibe. The wine list is extensive and the cocktails use local ingredients. The hotel works with several local businesses to give guests a true taste of Montreal without having to leave their hotel room. Mini bars are stocked with Broken 7 brews, the bar serves cocktails made with colas and ginger ales from 1642 Sodas, and Fairmont Bagel is available for onsite meetings. Rates change seasonally and typically start at $179 per night depending on the room type. Click here for reservations. Or get in touch with the Fathom Travel Concierge and we'll plan your trip for you. Montreal feels like Europe without the transatlantic flight and the jet lag, and there is plenty to see and do around the hotel. In addition to the incredible shopping nearby, Loews Hôtel Vogue is walking distance from Restaurant Europa, a beloved Italian- and Spanish-inspired spot opened by childhood friends and local restaurateurs Ludovic Delonca and Patrice De Felice. Brick walls, white tablecloths, and glossy black leather chairs create a simple setting for artful dishes. For a healthy option, nearby LOV is a chic French restaurant with bright, garden-inspired interiors, hanging rattan chairs with palm-printed pillows, and terrariums dangling over white wooden tables. The self-proclaimed botanical cuisine is dedicated to using the freshest vegetables for each dish. Conveniently close to several cultural sites, Loews Hôtel Vogue is walking distance from the Old City and Basilica of Notre-Dame de Montréal. From there, it's a nice wander down the cobblestone streets to the Old Port for the best view of the St. Lawrence River. Nearby Mount Royal Park and Belvedere has an observatory with amazing views of the city. The Museum District, home of the The Montreal Museum of Fine Arts shouldn't be missed. Come winter, ski resorts Mont Blanc, Owl's Head, and Mont Tremblant are easily accessible by car. Delfina is an intern at Fathom. She lives in New York City and travels for the work and play.